Come for a great day out in the woods! You can walk, cycle, play or have a picnic in these lovely woods. Experience life in the trees with Go Ape, take a relaxing break in our café and finish your visit with a quiet stroll in one of the more remote parts of the forest. 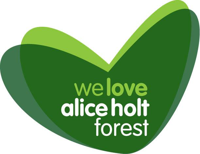 Alice Holt Forest is open 364 days a year (closed Christmas Day) from 8am and closes at 5pm (December – February), 6pm (March), 7pm (April), 9pm (May – September), 7pm (October) and 6pm (November). The Cafe on the Green is open 9am - 4:30pm in the Winter and 9am - 6pm in the Summer (more about the cafe below). Support your local forest and save money. Get free parking for a year, plus a range of other great discounts. Why buy a Discovery Pass? Free car parking at your local forest for you and your family. Great national and local discounts* including 15% off Go Ape, 15% off Forest Holidays, 10% off Paramo Clothing , 15% off Muddy Puddles (plus free delivery), 15% off at Cotswold Outdoor, Snow and Rock, Cycle Surgery and Runners Need. *Terms and conditions apply. Buy a Discovery Pass online today and enjoy visiting the forest straight away. Try our fun, navigational challenge at Alice Holt using a simple map to find twelve Gruffalo markers hidden in the deep, dark wood. If you're feeling competitive, choose to run, walk (or skip!) the course against the clock. Hire one of our classrooms for running your own event. We offer a long hire for 4 hours or a short hire for 2 hours. Classroom 1 facilities include: chairs, tables, toilets and a small kitchen with a kettle and a fridge. The classroom garden is accessible through the rear door where there are benches and seats. Classroom 2 facilities include: chairs, tables and a small kitchen with a kettle and a fridge. Hirers are responsible for cleaning the floor and tables, removing all rubbish and replacing the furniture at the end of the booking. For further details and bookings contact us on 0300 067 4448. Cancellations made by the hirer after booking confirmation may be subject to a 50% cancellation fee within a month and 100% cancellation fee within 2 weeks of the booking. Nigel, our survival expert, can offer exciting outdoor party sessions. Den Building for up to 20 children aged 7+ (1 1/2 hours).Campfire and Food for up to 20 children aged 7+ (3 hours). Classroom Capers (messy fun making cardboard teepees plus a discovery walk) for up to 15 children aged 3 - 6 years (1 1/2 hours). Please note the classroom must be booked separately. For details and prices contact Nigel on 01420 476808 / 07989 652757 or email caroline.netley@sky.com . Go Ape is an option for older children (aged 10+). Their tree top adventure combines breathtaking scenery, tree-top wires, crossings & wind-in-your-face zip wires for an action packed party. Tree Top Junior is ideal for parties for younger children aged 4+. Contact Go Ape on 01420 520933 to book. Our Cycle Centre offers birthday parties, which can be tailored to suit your requirements from fun, games and challenges to maintenance skills. Contact the Cycle Centre on 01420 521297 for more information. Orienteering packs are available from the Café to use with our permanent orienteering course on site. The packs contain everything you need to use the course and cost £2 each. Or use our play areas and trails for inspiration for your own birthday party (for example a pirate themed party aboard the ship or a animal adventure along the Habitat Trail). Birthday parties are a speciality for the Cafe, offering pirate and fairy themes as well as party bags and other activities to ensure the parents get to enjoy the celebrations too. Contact the Cafe on 01420 521267 for more details and prices. pre-book please call 0300 067 4448. The maximum number of people permitted in a party is 30 in total (our barbecue pitches are not suitable for large groups or corporate gatherings). We ask you, please, not to bring your own barbecue for fire safety reasons. Portable and disposable barbecues are not permitted.